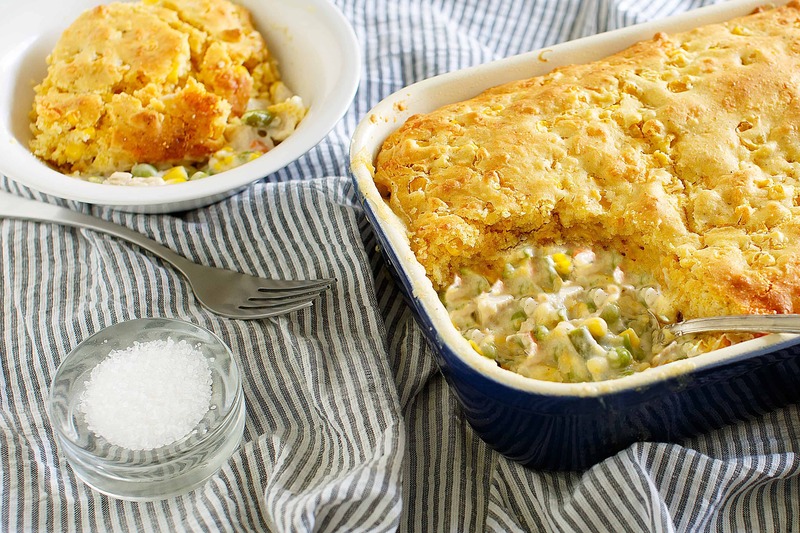 This from scratch cornbread topped chicken pot pie is unlike any other. 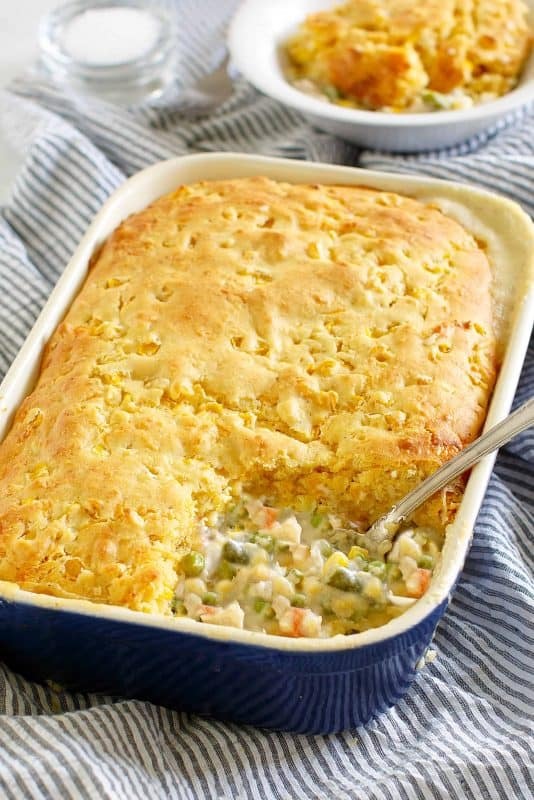 With a homemade cream sauce, generous topping of cornbread, it is a comforting meal-in-one that can win over folks who may not care for more traditional chicken pot pie recipes. 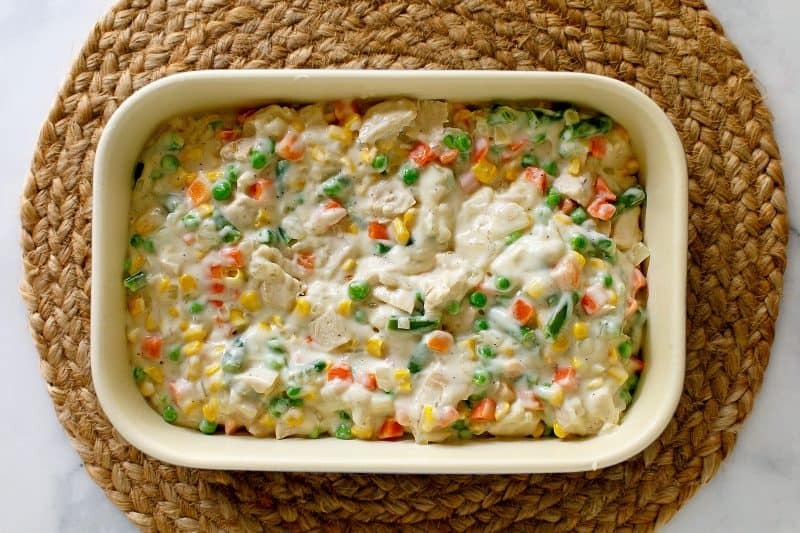 Streamline Cornbread Topped Chicken Pot Pie by preparing the filling the night before and storing it in a covered container in the refrigerator. Mix up the cornbread batter a half hour before supper, pour it on top of the filling, and bake! If you’d like to dive right in, just scroll down to the next photo to see the recipe steps, or scroll directly to the printable recipe card at the bottom. If you’ve a mind to visit a bit, keep on reading. With the weekend approaching, I’m making plans. We aren’t going anywhere or anything, but I’ve gotten in the habit over the past two years of trying to get my house and myself prepared in order to enjoy the weekend. Thursday is when I get started with making sure I have meals we can throw in the crock pot and such and Friday is full on what we refer to as “preparation day”, where I get my work done pretty early, my husband comes home from work early whenever possible, and we spend a little time tidying things up and making a nicer than usual supper so that we can disconnect and enjoy our life together over the weekend. One of the many benefits of this is that we’ve come to greatly appreciate our home more. In fact, our perspective has changed entirely in that department. Several years back, I was sitting outside on the back porch and a thought occurred to me as I looked up at brilliant blue sky peeping through a hole in my tall green pines. I realized that if this wasn’t my house, I’d be willing to pay good money to get to stay here for a weekend getaway. I know this sounds simple and to many of you it may seem obvious but today’s busy society has been conditioned to treat our homes as glorified way stations and drop off points, just a place to sleep before we get out in the world again. We tend to lose sight of what a tremendous blessing it is to be able to have a home and because of that, we don’t revere it for what it is. A retreat, a respite, a place of refuge from the world where you can be surrounded by the familiar, the people you love, and a hot meal. And now, every weekend is a staycation for us. We have become very focused on the dividing line between work and rest. The human body just wasn’t mean to go 24/7. We were designed, literally, to have a day of rest each week. I realize not everyone is able to do that, which makes me appreciate yet another blessing. You know the thing about blessings is that they are all around us, but they are mixed in with lots of opportunities to complain as well. Which leaves us with a choice of two things to focus on. Which one we choose makes all the difference in our quality of life. We’ve found that to be true firsthand. Now let’s make a delicious supper for our loved ones to come home to. Now listen, this recipe calls for more ingredients than I usually ask you to use. However, it comes together really easily and I will tell you that I’ve always hated chicken pot pie – but I love this one. So it’s worth the little bit of extra work. 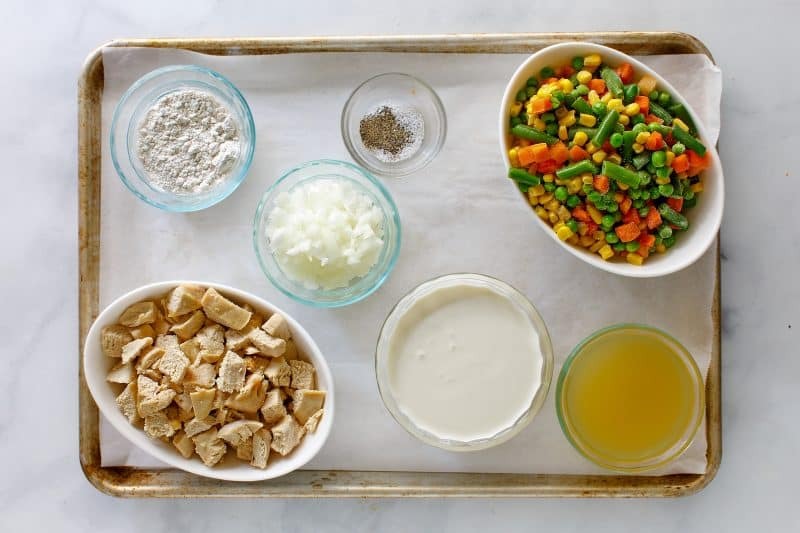 You’ll need: frozen mixed veggies, butter (it’s hiding in this pic), chicken broth, salt, pepper, all purpose flour, heavy cream, chopped onion, and cooked chicken. 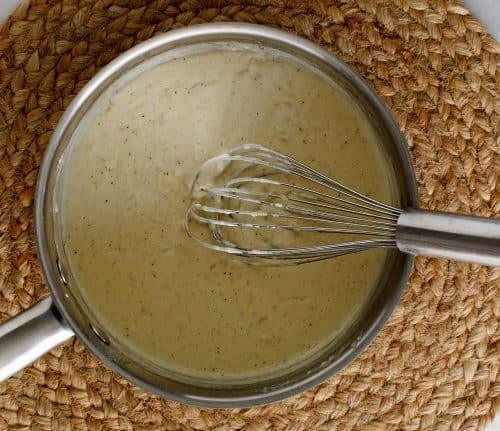 You can use a bouillon cube and some water in place of the broth and half and half in place of the cream if you like – but heavy cream is the absolute best. There are additional ingredients for the cornbread topping, listed in the printable recipe card at the bottom of this post. 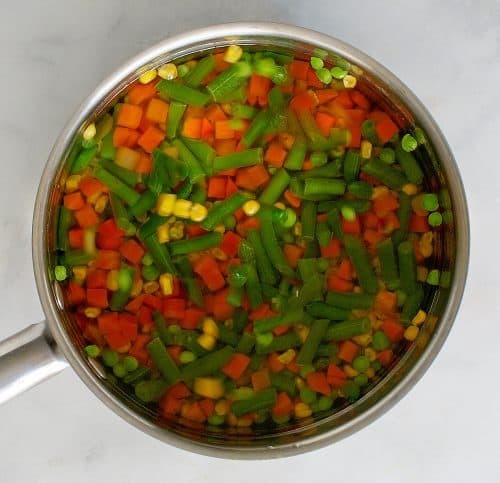 Cover your mixed veggies with water in a large saucepot and bring just to a boil over medium high heat. Cook until veggies are tender, 5-10 minutes. Drain in a colander. Melt butter in small saucepan over medium heat. Toss in chopped onions and sauté until just barely tender, about 2-3 minutes. Add chicken broth, salt, pepper, and flour and stir until well combined. Add cream and cook, stirring constantly, until the mixture has thickened, about five minutes. Remove from heat and pour over the vegetables. Stir in chicken. Spoon this into a greased 9×13 baking dish. Prepare homemade cornbread topping according to directions (recipe card at bottom of this post) and pour over top. Bake at 400 for about twenty minutes, or until cornbread is golden on top. Serve up this warm comfort meal to those who bless your supper table each night. Life is good and if you take notice of it, it gets even better. Preheat oven to 400. Spray a 9x13 baking dish with cooking spray. Place frozen veggies in a large saucepan and cover with water. Bring to a boil over medium high heat and cook until veggies are tender, about 5-10 minutes. Drain and set aside. Melt butter in small saucepan over medium heat. Add chopped onions and sauté until just barely tender, about 2-3 minutes. Add chicken broth, salt, pepper, and flour and stir until well combined. Add cream and cook, stirring constantly, until the mixture has thickened, about five minutes. Remove from heat and pour over the vegetables. Stir in chicken. Spoon veggie mixture into the prepared dish and set aside. Place cornmeal, flour, sugar, baking powder, and salt in a large bowl and stir to combine. Add milk, melted butter and eggs and stir until smooth. Stir in cheese and drained corn. Spoon cornbread mixture on top of veggie mixture and spread to cover the filling. Bake until cornbread is lightly browned on top, about twenty minutes. Enjoy! My fake plants died because I didn’t pretend to water them. This recipe is part of the Weekend Potluck and Meal Plan Monday! This looks like an amazing comfort food meal! My favorite kind. Thank you so much, Kristin! I hope you’re having a great day today! I will make this but having more vegetables (except corn) than meat in a recipe is against my religion. So I’ll up the chicken to a pound (3 cups) & omit the onion. Thanks! Onions are not evil . Canned corn is evil. Fresh and frozen are delicious! Have you tried Aldi’s Frozen corn? It is absolutely delicious. So fresh tasting. I won’t go back to other brands since having theirs! Christy two of my favorite foods in one dish. I’m trying this soon. Thank you for the delicious comfort food. That looks delicious! Look forward to trying it, soon! Also, I love what you shared about time at home with family and seeing, and being thankful for, our many, many blessings. It is such a blessing to be able to enjoy all the goodness that is right in front of us, and not be so caught up in everything else that is going on. Thank you for sharing, Christy. Hello Christy, it’s been quite some time since I’ve left a message. I’ve brought up the recipe several times and I’ve tried to print it off, but no matter which tablet or phone I use I get an error message and can’t print. And yes I’ve just printed another recipe to make sure it wasn’t my printer. it’s just this recipe. I’m going to write it down because I want to try it tomorrow. 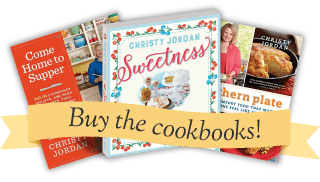 I love your cook books and have tried and love many of your recipes. Thanks for being such a sweetie. Hey Cassie! That is so bizarre. Each of my posts use the same code and printable plugin so there isn’t anything different on this recipe when it comes to the code. I really appreciate you being so thorough in letting me know what the problem is and I am relieved that other recipes are printing for you! I cannot even fathom what is happening different on this one page but MAN I WANT TO KNOW!! I am going to send this to my tech guy and see if he can look into it. I’m afraid it may be one of those weird unsolvable internet things but let’s hope not! If it is, maybe it will go away on its own 🙂 Thank you so much for taking time to let me know and for all of the helpful information. I appreciate you being here and sticking with me! Hello, when I have trouble printing any thing I copy and put it in my word or anything that I use to write a letter and then I print it, try this. I really needed a comfort food dish tonight so I was very excited to see this recipe in my blog feed and made it. It was soooo yummy!!! Thank you for sharing. I’m already looking forward to eating the leftovers. Hi Christy! I know this is probably against the law, but could I use my trusty Jiffy cornbread mix for the topping? If so, one box? I’m waiting for this answer as well! One box would do, I’m just not sure how thick it would be. then a woman in my fellowship group popped up with a new Jiffy [same company, same box] but across it is printed ‘vegetarian’ ….so however they dispense with the lard….Yay!! AAACCCKKK! JOANNE! I had no idea!!!! This is a deal breaker for me as well. Oh, whew, I immediately left the website to go to Jiffy’s site before reading the rest of your comment and then found they had vegetarian and came back to tell you and here it is, in the rest of your comment! lol Krogers in our area appear to have it! I just love your attitude, Christy. You are truly an inspiration! I have a small house and a small backyard here in North Texas but we have a covered porch back there and its a nice place to sit on a beautiful day. This recipe looks amazing! 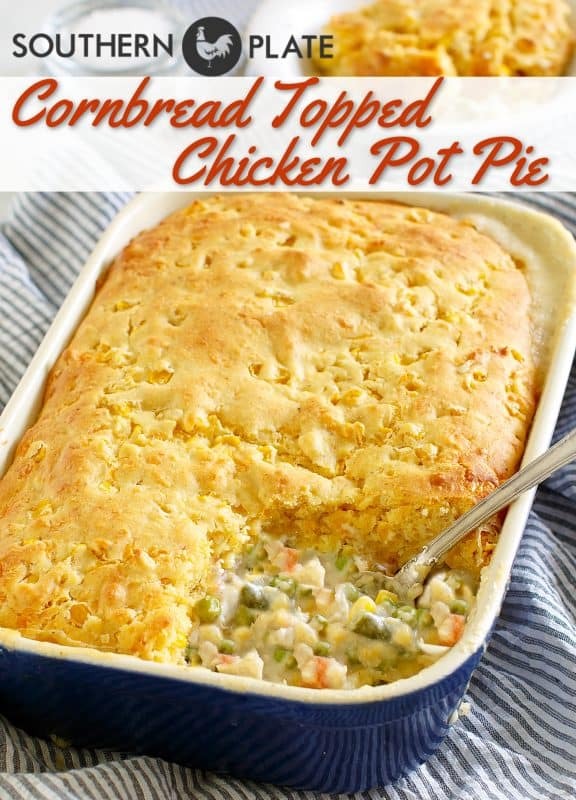 Chicken pot pie is something I can take or leave but I am going to try this with the cornbread on top. Yum! Hey Christy! I can relate to so many things in this post. We keep the seventh-day Sabbath and have for many years. Friday is always very busy getting the house and food ready for a true rest, which is a tremendous blessing. This recipe is one I plan to make for Friday evening supper or to have ready for Sabbath lunch. Thank you for all the great recipes, and for the inspiration. Happy upcoming Sabbath! Shabbat Shalom!!! Yes, Friday sure is a flurry but nothing beats that wonderful rest. I’m so glad you’re here, Kim! (sent you an email yesterday actually!). May YHWH bless you and your house! Can you use selfrising cornmeal and self rising flour and omit the baking powder and salt? You sure can, but it will likely have too much leavening in it. I would just use the cornbread recipe for a single pan on the package of self rising corn meal because it already has flour in it. I’m with you on staying home! I love my house. 🙂 isn’t it just a wonderful place to be ?!? Well I’m back after throwing away 3 boxes of Jiffy corn muffin mix from my pantry. Thank you SO MUCH for letting me know. Sometimes you just get so used to using something that you don’t think to look. Sift together dry ingredients; add buttermilk, egg, and butter, mixing just until dry ingredients are moistened. sweet!! thanks!!! My hubby doesn’t know it yet, but he thanks you too…..
Hey girl, in this cornbread recipe you call for buttermilk. Don’t always have that. Will 2% milk work? oh and I don’t use solid shortening any more [thinking Crisco] and when I use the recipe I will thicken and ‘curdle’ my milk and substitute coconut oil [it’s semi-solid]….tonight will be the flagship new me with out Jiffy and from scratch!! Thanks, thanks!! Love, love homemade cornbread. Thanks so much for all you do. Love you and your family much. This was a big hit with my family! The “from scratch” cornbread topping was easy to prepare and so much better than a mix. It was a nice contrast to the flavorful “pot pie” it covered. This is definitely a keeper. Thank you! I am so glad to hear that you liked it!!! Think I will try this on but I’ll make my usual filling. When it comes to chicken pot pie my hubby is picky about the filling but not the crust. So far I’ve done regular pie crust, a garlic pie crust, a puff pastry crust, a buttermilk biscuit crust, anda Red Lobster Cheddar Bay biscuit crust. But I haven’t tried a cornbread crust. It’s time for it. Hey Donna, I hope you will come back after you give it a try and let me know what you thought and I would love to hear what your favorite topping has been so far!! I ran across this dish on ‘My Sweet Little Bluebird” site and had to have it! I make pot pies frequently but always with regular pie crusts. Can’t wait to try this one out ’cause I dearly love cornbread. My family calls it johnny cake. I hope you enjoy it Roger!!! Thank you for coming over to visit and I hope to see you again real soon! This was a hit! I had homemade broth so it was even more delicious. I used fresh carrots, onions, green beans and frozen peas. I like the combination crust, very tasty! Thanks for posting! I am so glad y’all liked it Debi!! !